Senior researcher Stephanie Carroll Rainie critiqued the application of social determinants of health models in Native communities and challenged readers to reconsider how they think about Indigenous health. Rainie, Stephanie Carroll. 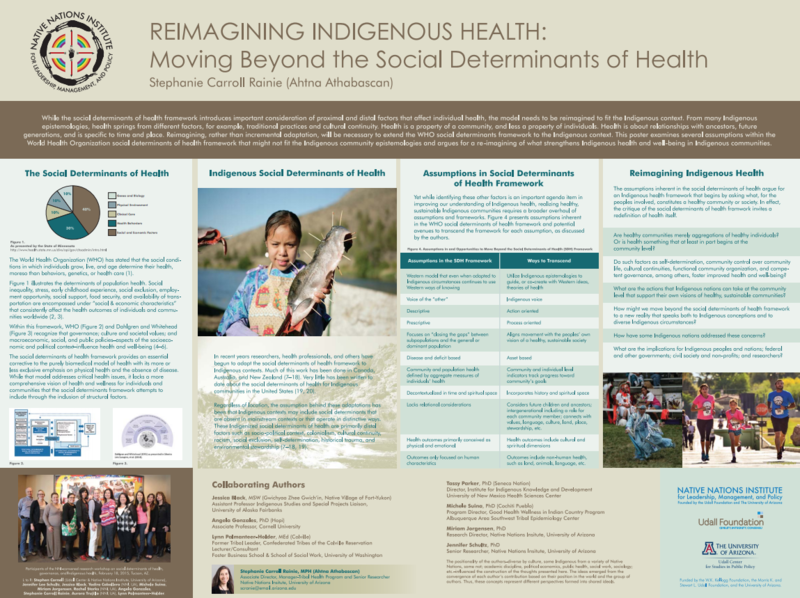 Reimagining Indigenous Health: Moving Beyond the Social Determinants of Health. Poster Session: Research to Fuel our Futures. The NCAI Policy Research Center Tribal Leader/Scholar Forum. National Congress of American Indians Mid Year Conference. St. Paul, Minnesota. June 30, 2015. Poster. From the Rebuilding Native Nations Course Series: "Why are Some Native Nations More Successful than Others?"